It’s been a long time since I’ve tasked myself with the challenge of “go big or go home” for the Secret Recipe Club. My first ever post was probably one of my biggest challenges; I made a croquembouche! This month I was assigned to Smells Like Brownies which is written by Melissa. She has a great collection of recipes, not just all baked goods either. I really debated on making something like crock pot dulce de leche, but figured it was too easy. (I will make it, just not for the SRC) Then I debated on coconut macaroons which ended up being a really strong contender until I found the macarons. Macarons had been on my to-make list forever but always ended up getting bumped in favor of something else. Well, that was about to be no more, I was finally going to make them. I wasn’t terribly intimidated to start out. I’ve been baking for a while now. I’ve made meringue and I’ve worked with almond meal so I felt like maybe I had a leg up in this challenge. 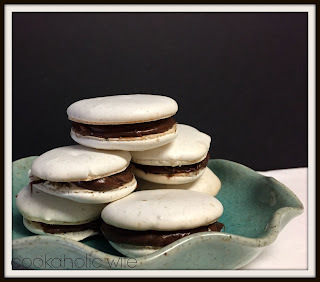 filling – ganache, buttercream, etc. 1. Adjust an oven rack to be in the center of the oven. Preheat to 350 degrees. 2. Line two baking sheets with parchment paper. Draw 2-inch circles on the parchment, 1 1/2-inch apart. Flip the parchment over. 4. Make a well in the center of the almond meal and sugar mixture and add the 82 grams of egg whites. Stir together with a wooden spoon until you get a paste-like consistency. 5. Combine the water and sugar together in a medium saucepan. Attach a candy thermometer to the side. Heat over medium high heat, watching the thermometer. When the temperature gets to 200 degrees, combine the remaining egg whites with the pinch of sugar in the bowl of a stand mixer with the whisk attachment. Beat on medium high speed until soft peaks form. 8. Gently fold 1/3 of the meringue batter into the almond meal batter. Continue to add and mix until all of the meringue is used or the batter runs off the back of a spoon in thick ribbons. 9. Transfer the batter to a large pastry bag fitted with a plain, round tip. Carefully pipe the circles, following the template on the parchment paper. Tap the baking sheet on the counter a few times to remove any air bubbles. 10. Bake for 9-12 minutes or until the cookies have grown “feet”. Allow them to cool for 2-3 minutes on the parchment paper before transferring to a wire rack to continue cooling. 11. Once the cookies have cooled, match them up in evenly sized pairs. 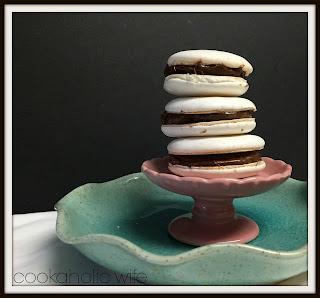 Spread ganache, buttercream or your filling of choice on the flat side of one cookie and press the flat side of an equally matched cookie to it. I debated not sharing this recipe with you and choosing another one, but food blogging has become so much about the perfect picture, the perfect recipe, that I feel like can sometimes make the typical home cook think their food is terrible because it’s not as pretty. And that’s not true! Sure, we all eat with our eyes first, but even if something isn’t worthy of a front page of a magazine doesn’t mean that it isn’t delicious. As you can see from my pictures, I didn’t get very many cookies sandwiches that turned out perfectly, but I’m okay with that. My second batch didn’t grow feet at all and they all ended up cracking. But macarons have not bested me yet. I plan on going over all the tips for how to get them to come out perfectly and trying again until I get the perfect batch. Nichole, so glad you tried this recipe! Macarons can be intimidating, but I'm glad you went for it. Delicious is so much better than perfect-looking! And yours look pretty good to me! These look heavenly! One of these days I will attempt to make a macaroon! Great SRC choice. 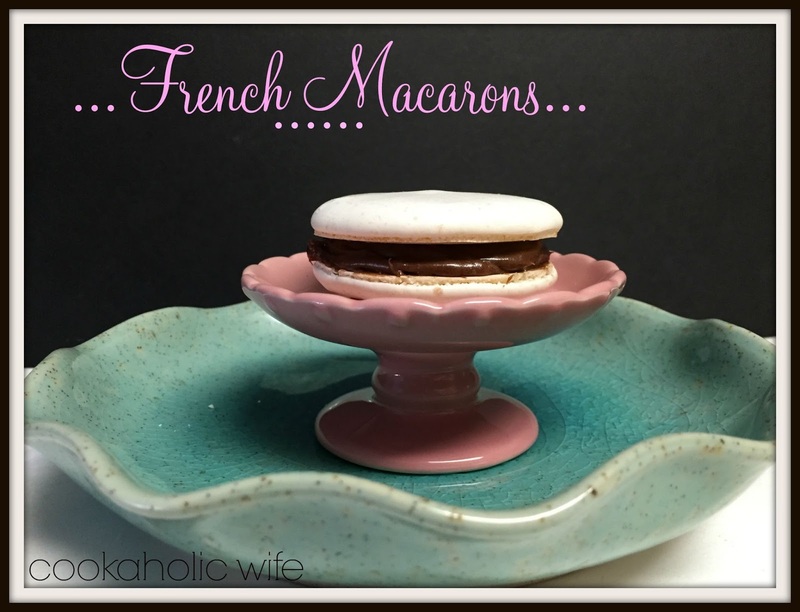 I've never made macaron, but they are on my bucket list! Looks like you did a great job!! Oh my gosh – what a challenge! You are so brave for choosing those. I love what you said about only blogging perfection – it's so true! Macarons are fun to make, and more fun to eat! Looks like yours turned out beautifully. I'm happy to be new the SRC this month – I'd love it if you'd stop by and check out my post. I keep meaning to try making macarons too but just haven't gotten around to it. I think you're pretty brave to try making them for SRC reveal. They look great to me and I bet they were really delicious!